NYSBCA President Bree Allen poses with Sen. Carl Marcellino. 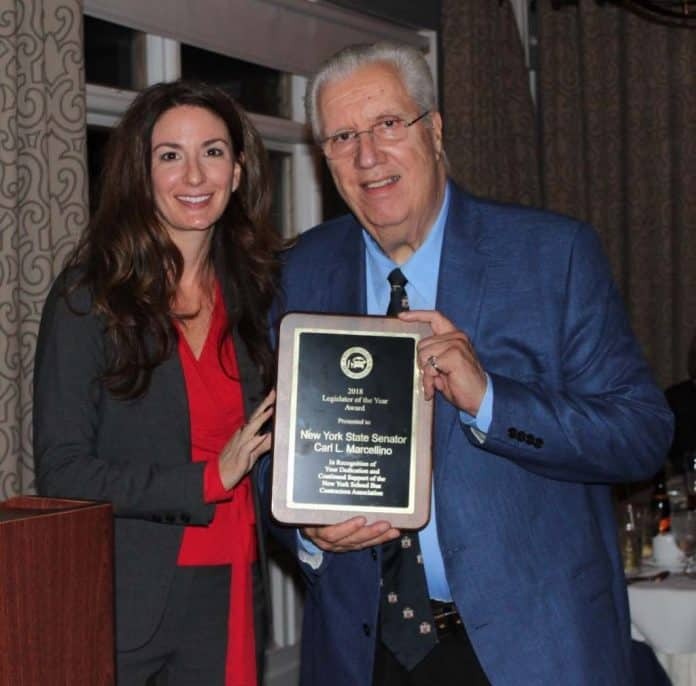 State Sen. Carl Marcellino was named legislator of the year by New York School Bus Contractors Association, on Oct. 13. Sen. Marcellino was elected to represent the Fifth Senate District in 1995. He currently serves as a Majority Whip and Chairman of the Senate Education Committee, and is an advocate for the NYSBCA’s mission, according to Marcellino’s bio. Marcellino is a sponsor of Senate Bill 2587-E, which states that bus drivers are required to pre-employment and random drug and alcohol testing. He also sponsored S8234, which passed this year. The bill was created to improve the development of school bus safety and security. The bill is designed to help safety efforts by improving coordination of polices and procedures within the school district. Marcellino was awarded for his dedication to the safety of students, especially while ridding a school bus. “It is a tremendous privilege to present Senator Carl L. Marcellino with our Legislator of the Year Award. We are truly grateful for his dedication and commitment to everything we do here at NYSBCA. His passion for education and students is something we admire. We look forward to our continuous relationship with the Senator,” said Bree Allen, NYSBCA President, in a press release. The Legislator of the Year award is an annual award presented by the NYSBCA. Last year the recipient was Sen. Jeff Klein.